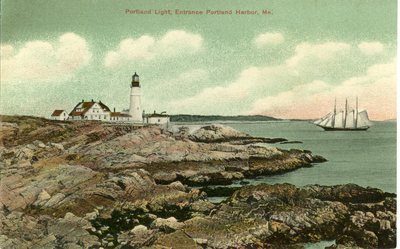 "Portland Light, Entrance to Portland Harbor Postcard "
An image scanned from a postcard of the Portland Light, now typically referred to as the Portland Head Light, and the entrance to Portland Harbor in Maine. A sailboat is heading to the shore. Rocky ledges lead down to the ocean. Published by G. W. Morris, Portland, Maine. The number 117316 is printed on the back of the card. No date.